I still can’t believe I spent five days and four nights at my parent’s hometown in Eastern Samar. Unlike my Baguio Trip last year, going to Samar is something that planned. We were going as a whole family so a lot of preparations from what date we will leave, how many days and what the mode of transportation will be were discussed mostly at the dinner table. The trip is a massive achievement unlocked for me and my family. It was our first out of town experience. I’ve never been in an airplane. Yes, you read that right. Although my parents had brought me in our province once when I was just five years old. But I have no memory of me on a plane and up on the sky. So, I have to start this story by saying how unforgettable my first airplane ride has been. It is definitely part of my most exciting experiences in life. Thankfully, my sister-in-law agreed to switch seats with me so I was able to get the best view from the window seat. Seated next to me was my eldest sister who is a frequent flyer so I had no worries at all. There is no direct flight from Manila to Samar so we had to get off at Tacloban Domestic Airport. From there, we rented a van that can tour us around Tacloban first before heading to our house in the province. The one hour plane ride wasn’t that frightening as I thought it would be. The only part I don’t like was the severe ear pain. Upon touchdown, we were greeted by the driver of the van and waited for my parents, youngest sibling and nephew, who had flown ahead of us to arrive. Once we were complete, our short trip around Tacloban started. The MacArthur Landing Memorial National Park is located in Palo, Leyte which is near Tacloban Airport. It is created in commemoration with General Douglas MacArthur famous parting words, “I shall return”. I have only seen the park in photos from my previous elementary book so I got really excited when we arrived in the area. The place is a great spot to take photos. After our quick trip at MacArthur’s landing our driver mentioned that there is an Oppa Park near the area. We were curious what the Oppa Park is all about so we agreed to go to the place. Little did we know that the real name of the Oppa Park was Korean Veteran Memorial Park. The park was created in honor of the friendship between the Koreans and the Filipino people. You will see huge rock formations in the park, a wall to take souvenir shots and more. Anibong Shipwreck Memorial is one of the eight cargo ships that were swept in land when Typhoon Yolanda hit the city of Tacloban in November 2013. 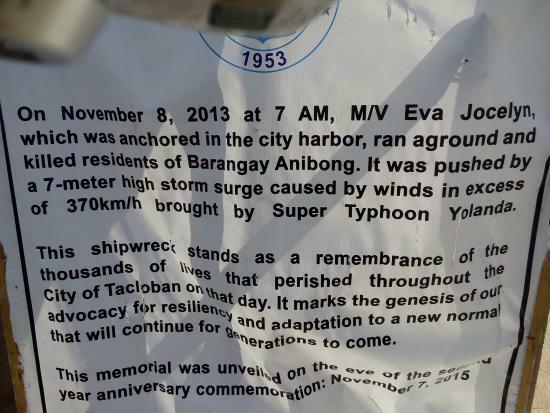 Do you remember Typhoon Yolanda? It was a vivid memory to me because it hit the country on the eve of my birthday, November 8. 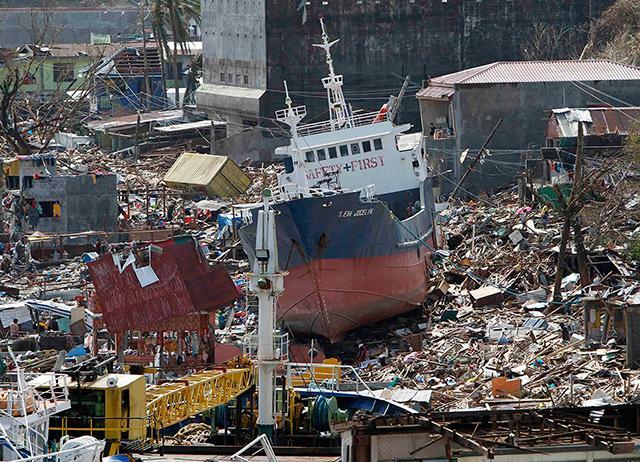 It was considered as the deadliest tropical cyclone to strike the Philippines in modern history. The image of a shipwreck getting swept in land because of the strong typhoon is hard to imagine. I saw this photo on Google Image on what the shipwreck looked like during the disaster. When you go to Anibong Shipwreck Memorial you can climb up the stairs and take a photo at the edge of the ship. 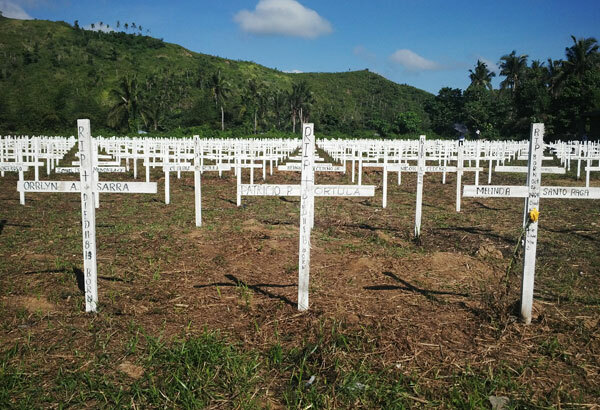 We also went to an open field turned mass grave for hundreds of Yolanda victims. Too bad I was not able to take photo because my camera already died. If you have time I suggest you reading this After Typhoon Yolanda Report from NEDA. After our trip to Tacloban we were ready to go to two-hour drive going to the province of Samar. This also marks the first time I will be seeing the famous San Juanico Bridge that connects Tacloban and Samar. The San Juanico Bridge stands at 2.16 kilometers long and is the longest bridge in the Philippines. We did a quick snap at the bridge and used my brother’s Go Pro instead so we won’t waste any time. When you are at the bridge you will feel all the tremble and vibration from the vehicles that pass by. Also sobrang nakakalula siya especially if you look at the river below. The San Juanico Bridge is considered as the main attraction when visiting Leyte and Samar. At around 3pm we finally arrived at our home in Cabay, Eastern Samar. A quick story about this house. Three years ago my father and mother started this goal to build a house back in our hometown. May minanang lupa yung Papa ko and everything left is to construct the house. All this time we, siblings, weren’t that involved in the idea. I have no intention to live in the province since all my life I’ve been in the city. None of my siblings showed interest too. But my parents were determined. 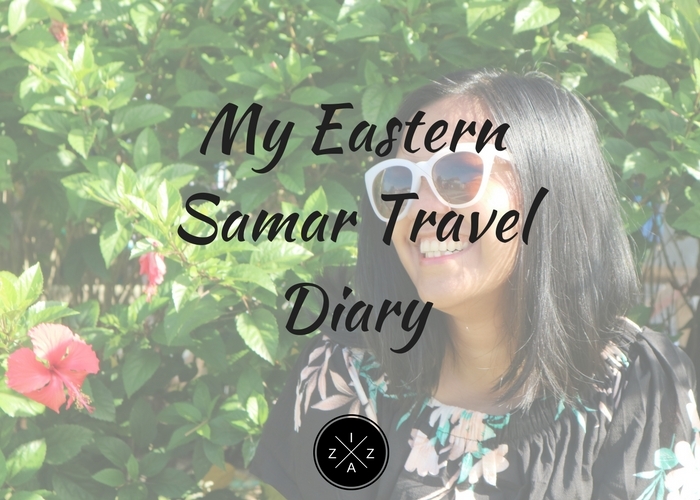 Every year they go to Samar and spend a week or two to check the construction of the house. They funded everything. 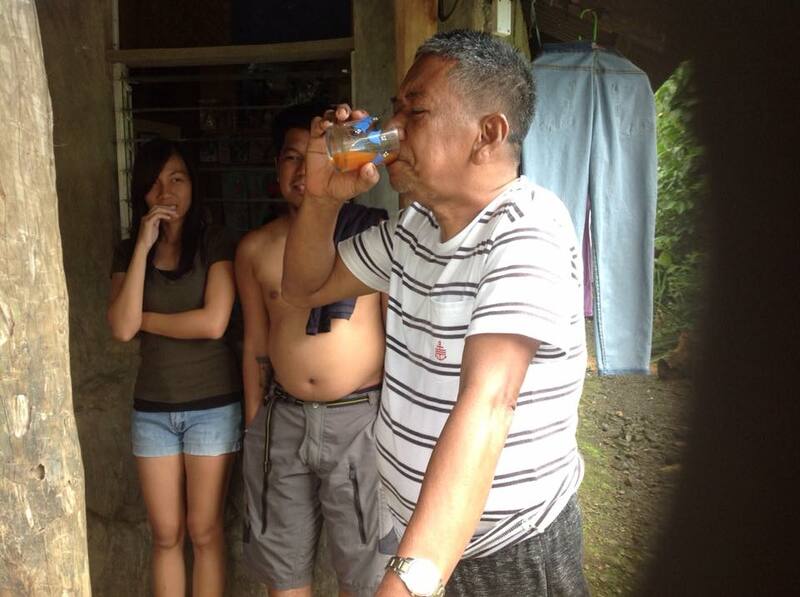 My father specially wanted to spend his retirement in the province. In 2016, my father turned 60 and the first floor of the house was done. My parents really wanted us to see and to experience a vacation in the province. I have no expectations at all about the next five days and four nights I will be spending in Eastern Samar. I actually thought it would be a boring vacation for all of us. No WiFi and No Signal. But lo’ and behold, the trip became one of the best and the most unforgettable ever. Even now, while I’m writing this post I am missing the life I had back in the province. Ngayon alam ko na kung bakit gusto nila Papa at Mama na makauwi kami. I have to quickly insert Cabay Beach or baybay in this post because this public beach is situated just behind our house! 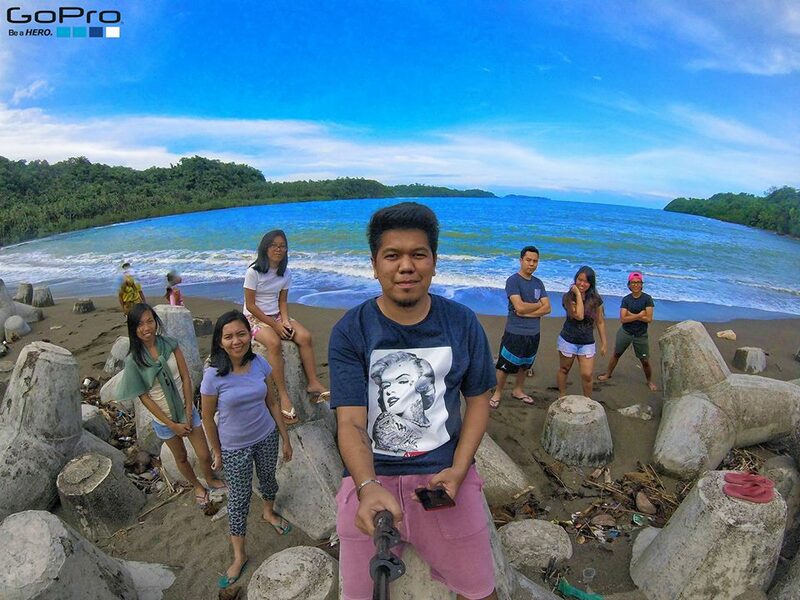 Me and my siblings spent a quick afternoon at Cabay Beach and felt all the beauty it has to offer. During the rest of the vacation we frequently visited Cabay Beach to relax. We woke up at around 6am the following day which was unexpected given na tanghali na kami madalas magising in Manila. We had breakfast as a family, a first after so many years. Since we don’t have any planned itinerary we relied so much with our parents. We spent the morning visiting our relatives, tito and tita as well as lolo and lola on my mother’s side. Then we went to a public cemetery where most of our relatives who passed away were buried. This is evident because we saw a lot of tombstone with family names such as Montes and Glino – my middle name and surname. My parents offered a prayer at the common area while we were at the back waiting in silence. After the visit we prepared for our first beach trip! Mina-Anod Island. It was my mother’s idea for us to go to Mina-Anod Island and experience a boat ride. 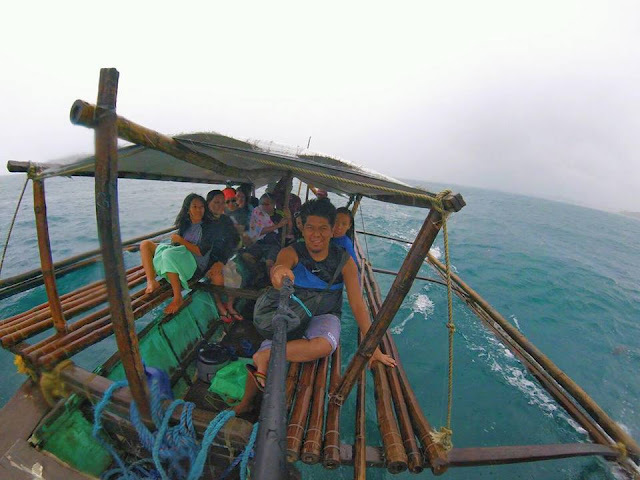 Actually, the trip reminds me so much of my islandhopping in Caramoan. The island of Mina-Anod is such a pristine heaven. Mabato yung area pero white beach kung white beach talaga. My tip is to wear an outdoor/sports sandals instead of normal beach slippers. We rented a cottage for only Php 200 and brought our own lunch and snacks with us. What you will love is that the entirety of the beach is not that deep but the waves are so strong. It reminds me so much of Lahos in Caramoan and I had so much fun with my family battling in the waves. After our Mina-Anod trip we went home already spent the rest of the evening singing in the karaoke. We woke up a little earlier the following day since we have to go to the public market at Borongan, the capital of Eastern Samar. My parents planned a get together with the rest of our relatives at Minasangay Island Beach Resort. Going to Borongan is an hour of tricycle ride away from our home in Cabay. I went with my mother, sisters and my elder sister’s boyfriend. We had a glimpse of the locals’ life in the early morning. Plenty were already running and/or jogging in the long and winding road. Although it is the start of Holy Week were able to score good and fresh seafood. Also my Mother cooked Afritada and Adobo, the easiest meal to food a group of 25 haha. 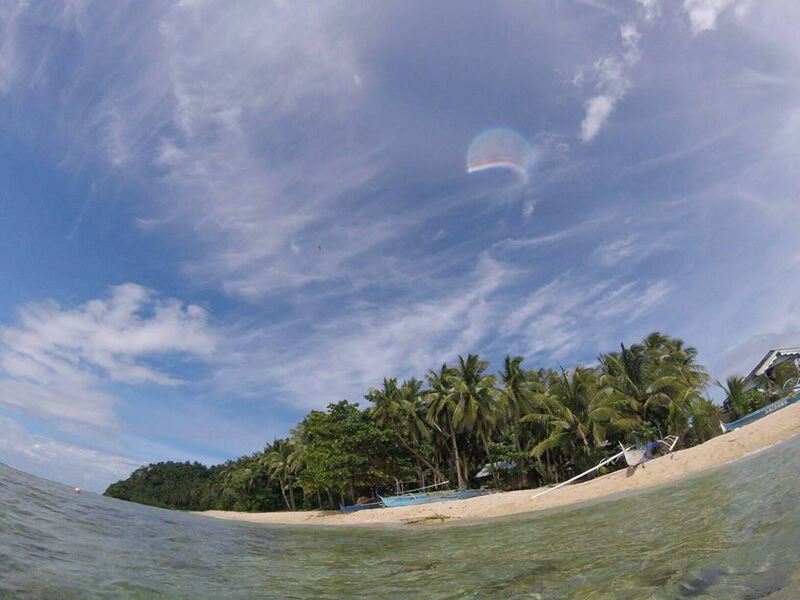 Minasangay Island Beach Resort is the hidden gem of Balangkayan. On the way to the resort you will find a lot of mangroves or small trees that grow in coastal saline or brackish water. Most of the mangroves were destroyed due to storm surge during Typhoon Yolanda but they were slowly coming back to life. You also don’t have to worry much because the entrance is really low. We only paid Php 10 each because were considered as locals from Cabay. Those coming from Manila or foreign tourists will have to pay Php 20 only per head. The main attraction inside Minasangay Island are the diving spots which is comprised of six levels. My youngest sister have tried up Level 4 while my brother did Level 5 at once. If you are not as adventurous to try diving, you can always swim. The Minasangay Beach is more enjoyable during high tide because the water is way cooler and the body of water becomes cleaner. Just be very careful because you might slip on big rocks. Minasangay is a must go when in Samar. I was surprised that there were a lot of travel guides and posts already about the resort on Google. This proves how much of a tourist spot the beach has become through the years. We left Minasangay Island Beach Resort all tanned and happy. Cabay, where we are staying is the hometown of my father. Caisawan, on the other hand, is my where my mother was born and grew up. 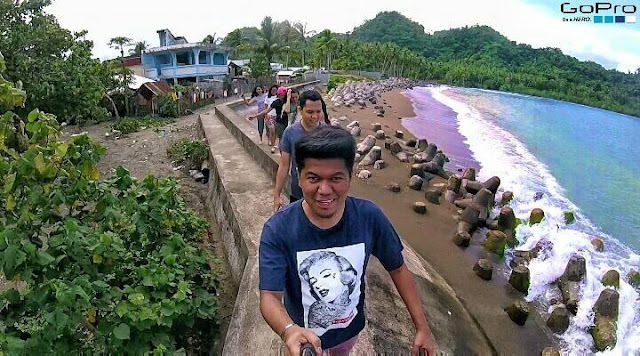 Going to Caisawan is a three-kilometer walk from Cabay. You actually ride a tricycle but we tried walking instead. Apply a lot of sunscreen. Trust me you’ll need it. 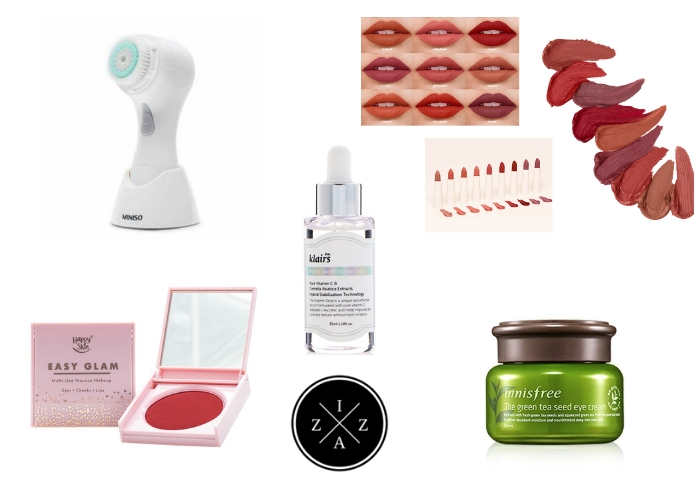 The one I used is the Belo which is a spray type that can be easily absorbed by the skin. 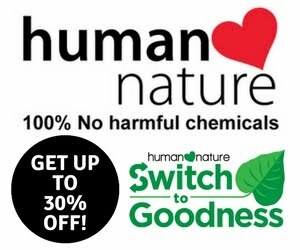 You can also try the Nivea Sun Protect and Moisture in SPF 50 or Human Heart Nature Safe Protect for just, SHOP HERE. Anyways, upon arrival at Caisawan we went to our relatives right away. We were able to visit the bahay-kubo built by our Lolo and the very kubo where my mother spent her childhood. Another great visit was Caisawan Elementary School where my mother finished her schooling. To end our long journey going to Caisawan we went and swam to the nearby river which was A-MAZ-ING. The river was so clear and serene. The current in the river was so strong na madadala ka talaga. We were all laughing so hard every time someone’s slipper get stolen by the current. After our quick plunge in the Caisawan River we had lunch at one of our relative’s home. My father even went on a tuba drinking challenge. And no, I did not dare to try. 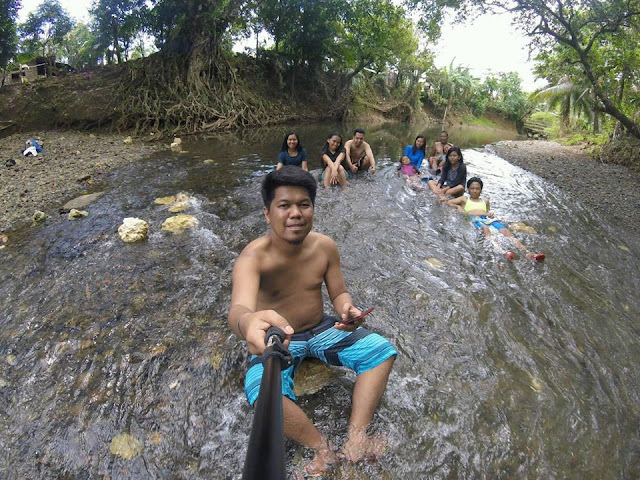 We maximized our last full day in the province by going to Llorente, a nearby town. Llorente is like Manila already although some parts will remind you of Vigan too. At the back of the city hall is the public beach of Llorente which is known for surfers. Signal is good in Llorente so we were able to update our Facebook and Instagram. Going home from Llorente to Cabay was tough since it was Good Friday and there were no public vehicle passing by. Thankfully after around 30 minutes of waiting a tricycle agreed to take us home. We were a family of 10 so just imagine how we were able to squeeze ourselves inside. Haha. It was also raining hard that day so we need to be extra careful. Back home we spent the rest of the afternoon eating buko. In the evening my father decided to share his strange stories about engkanto found in the Cabay beach or baybay. According to him when a person dies in the neighborhood you will hear mysterious noises like applause in the baybay. Scary, right? He even mentioned his personal experience when he saw a big shipwreck in the baybay. He was with his mother that time but when he mentioned about the shipwreck, my Lola did not seem to see and understand what it was my father was talking about. There was no shipwreck whatsoever. And have you heard of Biringan? Biringan is said to be the lost city of Samar and home to engkantos. The City of Biringan, apparently does not exist in the map of Samar but there were hundreds of mail and packages coming from and going to Biringan. Biringan even became part of a Kapuso Mo, Jessica Soho episode. They came to find Biringan but they attempt failed. The locals explained that Biringan will only open its city to selected people. Yung tumambad sa kanila, masukal na kagubatan. So, yeah, our last night in the province became more memorable because of that. The morning after was spent mostly packing. Fortunately, I was able to catch a final sight at Cabay Beach with my eldest sister and my brother and his family. Our flight was still at 7 PM but we need to arrive in the airport two hours early. This mean getting on the road as early as 12 noon. We arrived around 3 PM at Tacloban Airport and had a lunch first. I highly recommend this restaurant we found near the airport. Their food is great and affordable from the Bulalo, Pancit Bami and Sisig. Finally, our flight home arrived we got on the plane and bid goodbye to the well-spent vacation. 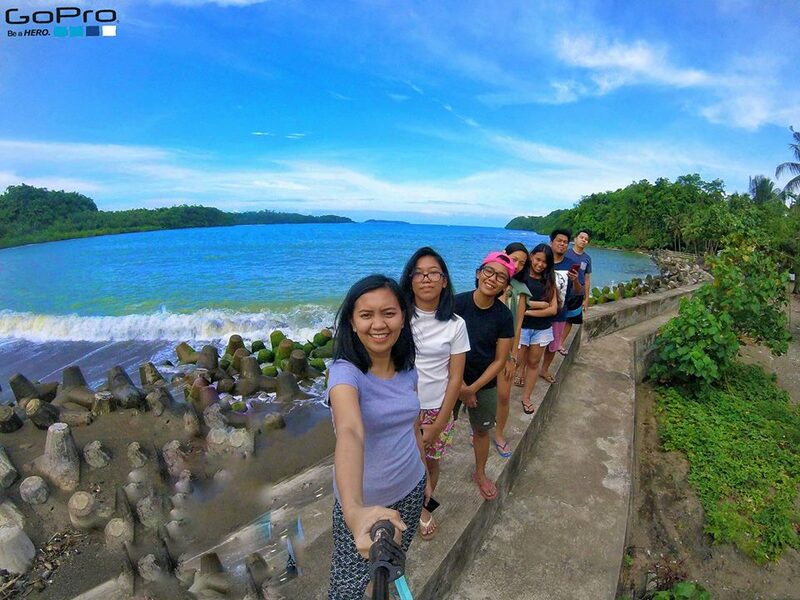 There are no words to explain how amazing my Eastern Samar trip has been. It is really a vacation to remember. My family has never bonded like this before. I feel like we became closer because of the trip. I will definitely come back to spend another vacation in Eastern Samar probably during festival season, like May 2019. Have you ever been to Eastern Samar?